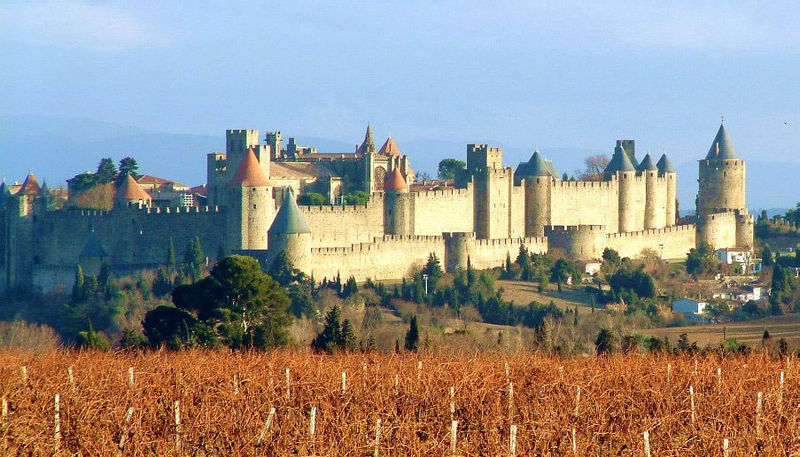 Carcassonne France is the largest medieval fortress in Western Europe. It’s beautifully restored and an amazing sight. It's one of the top places to visit in France. We visited in September and I’m so glad we did. It’s massive. 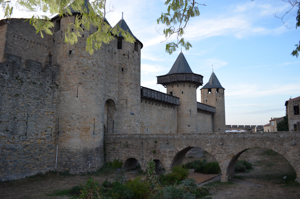 Carcassonne is in the Languedoc-Roussillon region of Southwest France. Just a one hour drive southeast of the city of Toulouse and 50 minutes from the Mediterranean. You can see it when you drive the A61 toll road. It sits majestically off in the near distance like a fairy castle. 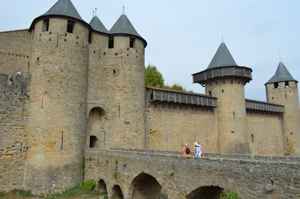 Carcassonne is a very popular tourist destination so you need to plan ahead. One of the top tourist attractions in France. To beat the crowds, it’s best to arrive late in the day when visitors start to leave and before 10am during high season. We got there about 5pm. It's one of the most famous places in France. 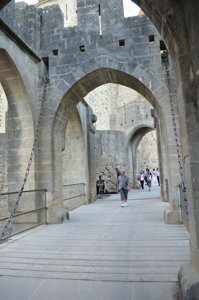 We entered through the main gate: porte Narbonnaise (Narbonne Gate) complete with drawbridge. Just inside is a tourist info center where you can get a map (it closes at 5pm). We used Rick Steve’s guided walking directions since it was after hours and came back in the morning and got the map. We walked around the fortress between the medieval walls, there are two: an outer wall and an inner wall. This medieval citadel is on the site of a Roman fortress built in 2nd century BC. You can still see the old Roman wall about 2/3 of the way up. 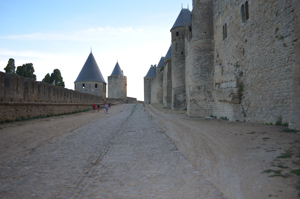 The top part of the inner walls and the outer walls were added in the middle ages. Use this French history timeline as a reference. This fortress was very important because of its location close the Iberian Peninsula, between the Atlantic and Mediterranean and at the cross roads of very important trade routes. It was a military stronghold. Many important battles were fought here. 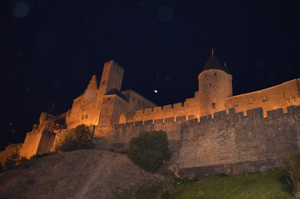 At one point it was used as a stronghold for protection of the Cathars, a Roman Catholic sect. The Vatican saw the Cathars as a threat against them and issued a kill order, aka crusade. 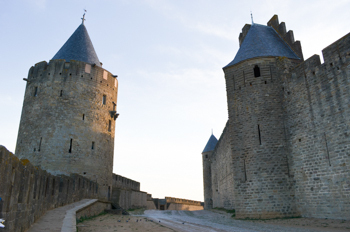 When France annexed Roussillon in 1659 the city of Carcassonne fell into decline in favor of the Basse Ville (the lower more modern city). In 1853 renovation started with Viollet-le-Duc, an architect. It was considered the finest example of medieval military architecture and needed to be preserved. Work on the renovation was completed in 1911. Today it’s a UNESCO World Heritage Site. 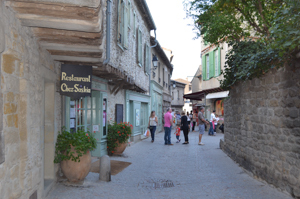 Inside the walls is the old town with cathedral, castle (the fortress within the fortress) shops and restaurants. After our walk around the streets and we found the restaurant recommended by our hotel, Brasserie Le Donjon. 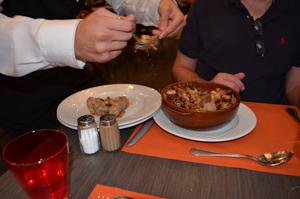 We wanted to try cassoulet because this part of France is where it originates. The traditional dish of duck, white beans, and Toulouse sausage baked in a crock. The chef here has a special certificate just for cassoulet. It was the best I’ve ever tasted. Truly delicious. The fortress is lit up at night and makes for a beautiful site. 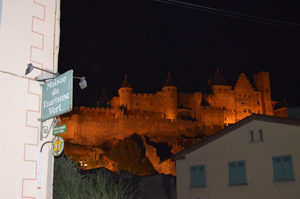 After dinner we took a walk to pont Vieux where you can see the full view of the walled city. The photo below was taken on the way out to our hotel just outside the walls. This shot turned out better than my ponte View photo. The Castle, “Château Comtal” was first built in 1125. The rulers of the kingdom of Roussillon lived here. If you saw "Robin Hood" with Kevin Costner this is the castle they used in the movie. 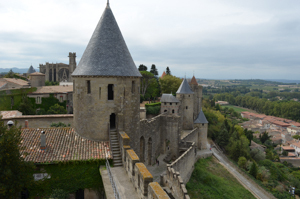 You get beautiful views from the ramparts so it’s worth the climb up. 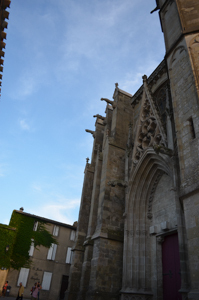 The St. Nazaire Church “Basilique St-Nazaire” is considered one of the best examples of Gothic architecture in Southern France. Upon entering the church we stumbled upon a live choral concert of what sounded like Gregorian chant. A Russian Orthodox a cappella group. They were probably singing in Russian not Latin. 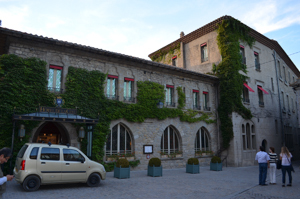 There are places to stay within La Cité (the walled city) and many hotels just outside the walls. We stayed outside the walls within a short walk to the gates. Made it easier to park and get in and out of the citadel. Hotels book up in season (July, August, September) so be sure to make a reservation. There is parking just outside the walls but the lot fills up in high season. Our place was the Hotel Mercure. The hotel is in the perfect location. Easy walking distance to the citadel. However, if all the rooms were like ours I don’t recommend it because it had an old slightly moldy bathroom shower. I did notice however that a room across the hall had a renovated bathroom so maybe there's better than our experience. The bed and room itself was very clean and comfortable with a view of the citadel from our French windows. Ratings are time sensitive so be sure to read the reviews to make sure it’s still a top place. 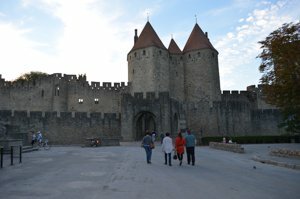 I’ve listed the hotels closest to the citadel that way you don’t have to park or sit in traffic. And you can get in and out before the crowds. 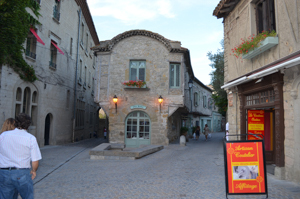 If you are going to travel in southern France it's definitely worth it to visit to this famous and satisfying tourist attraction. You are immersed into the past.